KTM's been lavishing a lot of attention on the Duke these days. It first gave the Duke a bigger heart to create the 1290 Super Duke R, and it has now turned to the smaller Dukes in the range, given them some fairings, and this is what we've got - the RC range. KTM's shown the RC125, RC200 and RC390 at EICMA today, and as we'd told you earlier, these are covered-up Dukes, and little else. The RCs even look the same, save for the stickers. KTM however, explains that these bikes, leaving aside the dual headlamps, indicators and registration plate housing, look like they've just escaped from the Moto3 pitlane. And you wouldn't really argue with a manufacturer that won the constructors' title last year, and is leading the Moto3 charts this year as well. The RC125 uses a 124cc single-cylinder engine, but what we're really interested in is the RC200 and the RC390. The 200 still makes 25.5bhp, while the 390 makes 43. The 200 weighs 137.5kg dry, and the 390 weighs 10 kilos more. All bikes use the same six-speed manual 'box, suspension from WP, Brembo disc brakes front and back, with ABS as standard on the 125 and 390. KTM says that the altered geometry, steeper steering head and shortened wheelbase, along with firmer suspension will go a long way in making the bikes behave like proper supersports. 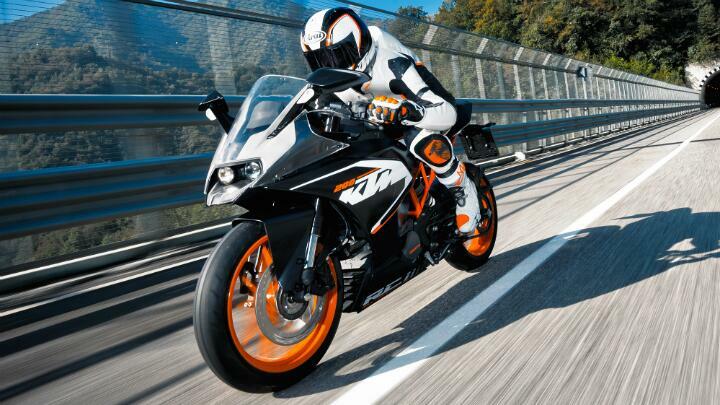 Now, we know that the RC200 and 390 are headed to India, and we do expect to see them at the Auto Expo in February. What do you think of the new faired-in KTMs, dotcommers?